I thought I would love the Kelsey Ruffle Top as much as I love the Palmera Ruffle Cami but I don’t. The ruffles just don’t look ruffle-y and kind of sit there covering up my chest, rather than ruffle around the very flattering v-shape neckline of the Palmera. The button down style of this cami also gives off this weird peasantish vibe to me, which was not the dressy feel I was going over. For some reason, I think it only works somewhat when it’s tucked into something. Otherwise when I wear it I almost feel like one of those old grannies sitting in her bloomers on a stool on the street, chomping away at watermelons. Hmm, perhaps a faded memory of my childhood there. I sized up in the printed version simply because they didn’t have it in my usual size, but turns out the Navy version I did get in my usual size was way too small for the girls…and I looked totally ridiculous. Do you see the weird gaping hole on my chest? Yes, it’s because the buttons barely closed over the girls, then because the top part would have no chance in hell of closing, it decided to flare out…then meet up again at the top. Don’t ask – I have no idea what’s going on with this. Not keepers. If you would like to try the Kelsey Ruffle Top, get the printed version here or the solid color version here from J.Crew, both $49.99 (Final Sale now!). I’ve seen a lot of positive reviews of the Victoria Ruffle Tissue Cami in the blogosphere, hence why I bought it though I never really paid much attention to it first. I thought it would be too “tissue-y” and therefore cling and show every tiny bump and roll on the body, rather than drape nicely throughout. I got a Small, my usual knit tee size, and it fits fine. It does cling but it’s very soft and comfortable. I may not feel totally comfortable wearing it untucked because it will easily show whether my lunch was light or not (mostly not). 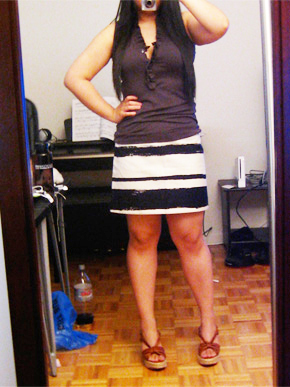 But tucked into pencil and mini skirts, it’s adorable and do-able! I love that it gives the dressy, ruffly feel of the Frances/Victoria/Palmera silk ruffle camis (click here to see what I mean), but is 10 times softer, more comfortable, and much more wearable. I found myself wanting to wear it with every skirt I own, hence why you see it here with the Brushstroke Mini and then in the post below with the Ink Blossom Pencil Skirt! Not only does it match almost everything but the dressiness of it matches perfectly with the dressiness pencil/mini skirts already give off. Here’s a close up of the ruffles. I really wish I had also picked up the Prism necklace from J.Crew. Wouldn’t it look perfect with this top and this outfit?? Anyway, I highly recommend this top, especially at the low $29.99 price. It’s hard to find something that will make you look so put together but is so comfortable and soft. Get it here from J.Crew for $29.99! A ton of colors are still available! I was on the fence about the Ink Blossom Pencil Skirt from J.Crew. I just couldn’t decide if I hated it or loved it. The colors are ok it seems, but what exactly is the pattern? Floral? “Artistic” ink blotches? Leopard? I just didn’t really get it. 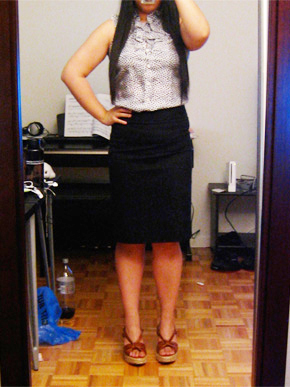 But I’m really loving the shorter pencil skirt length so I figured I would try it for myself. Well, it came and I love it! In fact, while I was trying on different tops and planning outfits for work, I kept pulling this skirt out and thinking the top would look cutest with it. It clearly fills some kind of void in my wardrobe. 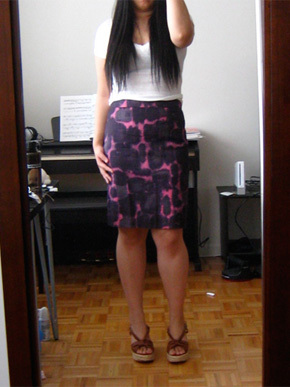 Out of my print pencil skirts, I have mostly lighter pencil skirts (think Sunshine Peony Pencil Skirt, Canterbury Bells Pencil Skirt, etc.) so this one definitely fits right in. Please excuse the I’m-too-full-from-dinner look. 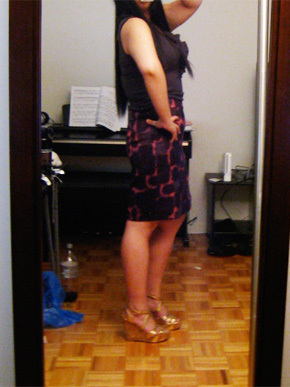 I felt super comfortable in this skirt and really did not want to take it off. The fabric is a soft linen canvas material, much like the Brushstroke Mini actually. Light, moves with your body, comfortable. It is also pretty versatile – matches with light and dark colored tops. It looks so put together even when I just throw on a plain white tee! 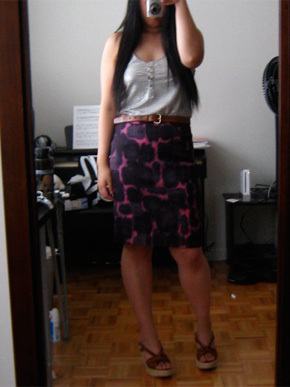 Gotta love pencil skirts. 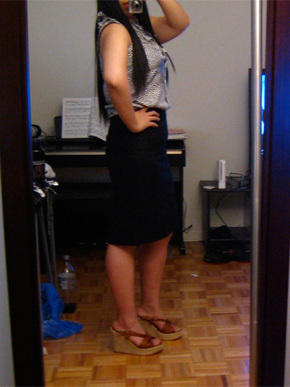 It also hit me that I now own everything necessary to recreate the J.Crew styled look, so here it is. Pretty cute, right? I’m a huge fan. This one is a definite keeper. 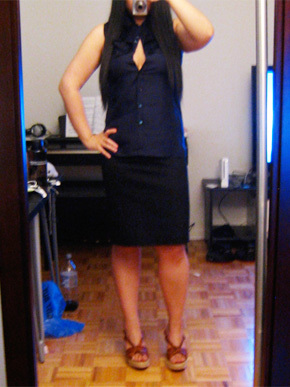 Oh, and I got my usual pencil skirt size. Fits perfectly! Get it here from J.Crew for $110 (now on sale for only $59.99! ).